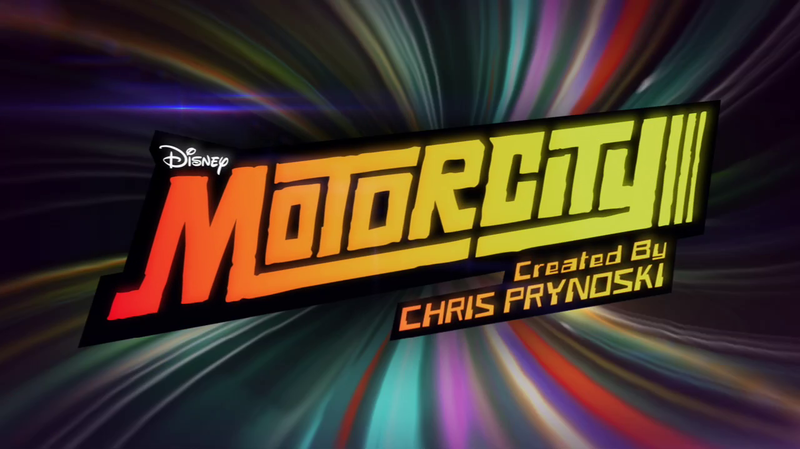 On April 30, 2012, the Disney XD original animated series Motorcity premiered. The series took place in an alternate universe version of Detroit, with a group of rebels known as the Burners fighting billionair Abraham Kane, who built his version of utopia over the old city of Detroit, now known as Motorcity. The series was a co-production between Titmouse, Inc. and Disney Television Animation. The series only lasted for one season, with 20 episodes, and ended its run on January 7, 2013. It was created by Chris Prynoski, and was directed by Prynoski and Juno Lee. It starred Reid Scott as Mike Chilton, Kate Micucci as Julie Kane, Nate Torrence as Chuck, Kel Mitchell as Dutch, Jess Harnell as Texas, Brian Doyle-Murray as Jacob, and Mark Hamill as Abraham Kane. The first episode, “Battle for Motorcity,” begins with Mike and his friend Chuck attempting to go down in the inner depths of Motorcity to find a fusion battery. While they uncover the jackpot of parts that they need, Julie warns them that Kane’s forces are about to storm the East Gate. The East Gate falls as Julie warns them, and they hurry back with the battery as the place falls apart around them, thanks to Mike pulling some skull decoration lodged in a wall. The two scramble their way back to the surface and back to Mike’s car, where he places the skull on the selection lever and speeds his way out through the wreckage of Motorcity, with Chuck leading his way out. While Julie waits for the battery, Kane makes an appearance on the Easy Gate screen, telling them all that he will take the entire city out, and has sent a “friend” to help him do so: a giant robot. Mike arrives just in time to place the battery close the gate, destroying more of the robot, with Mike taking care of the rest. Kane then calls Mike a coward for “abandoning his post,” as Mike used to be a cadet with Kane’s army. Back in his office, Kane remarks that Mike is giving Motorcity residents hope, and “hope is a dangerous thing.” He then thinks that if he had spotted Mike’s traitorous behavior early enough, all of Detroit would have been his already. Back at the Burners’ garage, everyone is fixing up their cars, while Julie cheers up Mike, who wishes he could fight Kane face to face. Julie then heads off to her internship at Kane Co., as she is the Burners’ inside connection. Kane then announces that he will be appearing at Kane Co. Square, in person, to reveal something new. Mike decides this is the perfect opportunity to take Kane down, although Dutch and Tex are less than thrilled with the idea. Dutch fixes up Mike’s car for the event, though, which Mike is thrilled about. The gang then heads to Detroit Deluxe to take Kane down. Julie tries to figure out what the announcement is, and realizes that she needs to warn the Burners. Her warning comes too late, and she tells them that she needs to turn around, but Mike refuses to listen. When Mike thinks he has Kane cornered, he realizes that he’s been tricked, and the gang is quickly trapped. Kane then sends his robots through the defense matrix to trap them. As Julie heads off to help the guys, she is stopped by Kane, who wants to give his daughter a hug. Kane is completely unaware of her fight against him. In Motorcity, the residents scramble to survive against the robot attacks, while Julie works on a way to get out of the guys out of their pods. The guys are finally free, and they head back to Motorcity to save the residents. 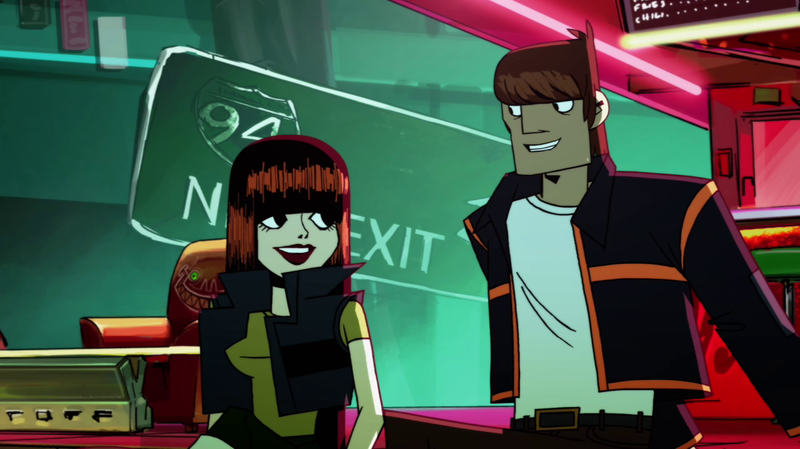 Kane torments Mike, telling him it’s too late to save Motorcity, but Mike refuses to take the bait. The Burners work fast to take down the robots, and Kane arrives in the last robot to fight Mike one on one. Mike declares that his fight is for Motorcity, especially after Kane betrayed him, and wins the battle. The Burners celebrate and fix their cars back at the base after watching Kane announce that he is tripling his efforts to eradicate the Burners. Posted in Uncategorized and tagged 2010s, Animated Series, Color, Disney XD, Television. Bookmark the permalink. 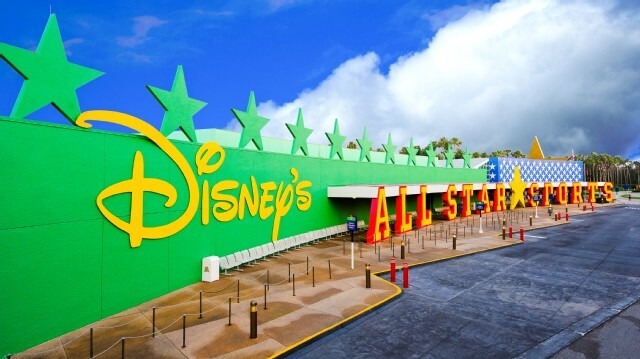 On April 29, 1994, the first unit of the All-Star Resort hotels opened in Walt Disney World. The first unit belonged to the All-Star Sports Resort; it was named Surf’s Up, and had a theme of surfing. This was soon followed by the Hoops Hotel, Touchdown, Home Run Hotel, and Center Court. The hotels themselves are moderately priced, and features two restaurants: End Zone Food Court, and Grandstand Spirits Pool Bar. All-Star Sports is the first in the series of hotels, and was followed by All-Star Music in November 1994, and All-Star Movies in 1999. Posted in Uncategorized and tagged 1990s, Disney Park, Hotel, Opening. Bookmark the permalink. 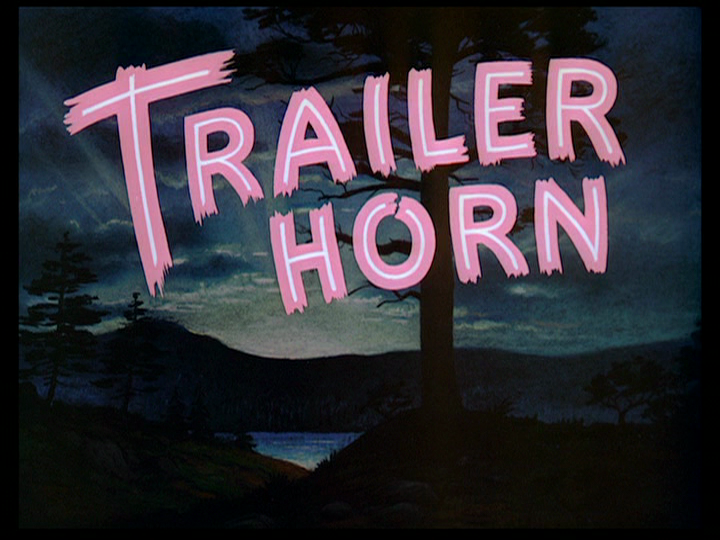 On April 28, 1950, the Donald Duck short film Trailer Horn was released to theaters. It was directed by Jack Hannah, with story by Roy Williams. Dawn is rising over the forest, and Chip and Dale are sound asleep in their tree, until the sunshine wakes up Chip. Chip runs around outside, skipping at leaping about, when he sees some strange footprints outside. He calls out for Dale, who doesn’t believe that Chip has found some large footprints. They follow the prints to a trailer, and see Donald sound asleep in his bed. Chip then hears a strange noise, and sees Dale jumping up on the car’s horn like it’s a trampoline. The honking wakes Donald, and he grabs Dale. 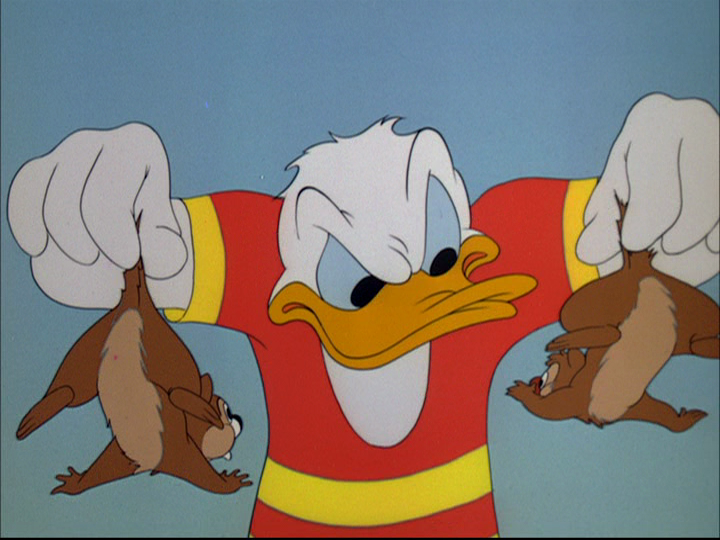 Chip saves Dale by biting Donald’s foot, and an angry Donald goes back into his trailer. The chipmunks laugh at the incident, and soon see Donald leaving the trailer in a bathing suit. Donald sets up a diving board, and attempts to dive into the nearby lake, when the chipmunks push the diving board forward. Donald lands face-first onto the board, and looks around, confused. He attempts to jump again, when the chipmunks push the board around so that Donald will dive right into his trailer than the lake. After wrecking his trailer, Donald steps out to see the chipmunks laughing, and catches them. He shoves them into his car’s horn and honks it a few times, then throws them into a pie and throws the pie at a tree. Donald laughs and returns to his trailer. Chip, wanting revenge, decides to throw a pine cone into Donald’s cup of coffee, then uses more pine cones to destroy Donald’s breakfast. Donald then uses his car to try and knock them out of the pine tree. He corners them with driving the car onto the tree, but when the chipmunks step off, the tree gives Donald and his car the slingshot effect, sending them flying into a nearby ledge. Donald walks away in a daze, thinking he’s still driving. 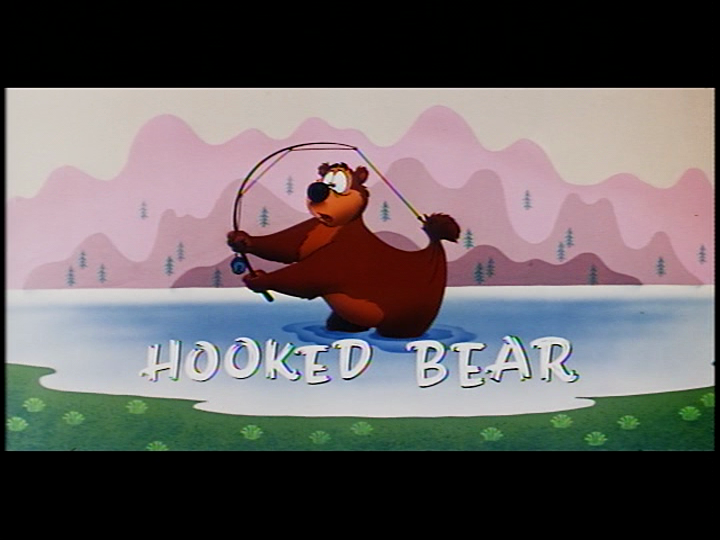 On April 27, 1956, the Humphrey the Bear short film Hooked Bear was released to theaters. This was the first of two shorts in Humphrey’s own series; his run unfortunately ended when short films were discontinued in 1965. It was directed by Jack Hannah, with story by Al Bertino and Dave Detiege. Ranger Woodlore steps out excitedly from his cabin, as the fishing season has begun and the lake is full of happy fishermen. Humphrey the Bear is also fishing, but not as well as those with fishing equipment. Seeing their success, Humphrey runs off to the fish hatchery and grabs all the equipment he can find. Woodlore, who had been measuring the size of the catches to keep the visitors happy, realizes that the lake is running out of fish, and quickly makes his way back to the hatchery. He comes across Humphrey with the stolen gear, and orders Humphrey to go back and “fish like a bear.” He enters the hatchery and fills up a trough with water, and places rainbow trout eggs in the trough. The fish sprout up like weeds, and Woodlore releases the fish into the lake. Humphrey finally catches a tiny fish, but it is soon eaten by a larger fish. Although he manages to retrieve his tiny catch, he realizes after he let the larger fish go that he can use the tiny fish to catch the bigger fish. His plan works, and he is soon holding two armfuls of fish. When Woodlore comes back to drop in more fish, Humphrey gets overly excited and drops his entire catch, realizing too late what he’d done. He starts to sob, but starts his plan again, until Woodlore makes him drop the small fish because it was “too small.” As Humphrey walks underwater gathering his catches again, he spies a huge fish and tries to catch it, only to find that it was a child’s toy. Desperate, he takes the rudder from a child’s toy ship and ties it to his head, making it appear to the fisherman that there’s a shark in the water. As the fishermen flee, Humphrey starts gathering all of their caught fish. Humphrey runs across Woodlore again and hides the fish in a nearby container. When he sees Woodlore dumping more fish into the container, he is excited, and drops himself into the container when Woodlore is not looking – not realizing that the “container” is actually a small plane that will air-drop the fish into the lake. Humphrey hangs on to the plane for dear life, but when he sees more fish drop, he tries to catch them, and falls into the lake. Woodlore gets a phone call from the Chief, who informs him that fishing season ended the day before, and Woodlore quickly sends the fisherman packing. Woodlore tells Humphrey that fishing season is over, leaving Humphrey with no fish. He then reveals that hunting season has started, and Humphrey runs around the park, dodging bullets every which way. 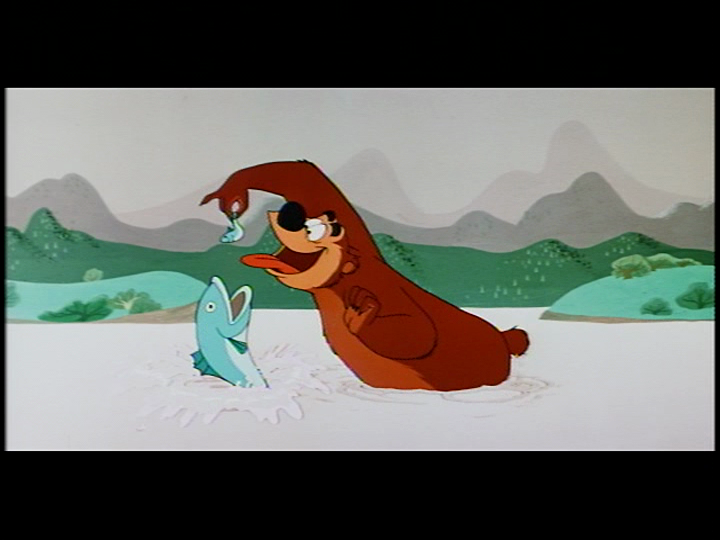 Posted in Uncategorized and tagged 1950s, Color, Humphrey the Bear, Short film. Bookmark the permalink. 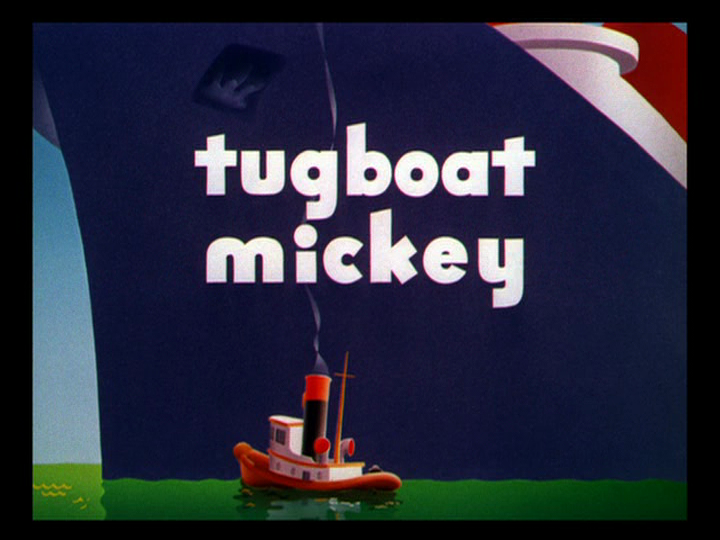 On April 26, 1940, the Mickey Mouse short film Tugboat Mickey was released to theaters. This is one of several shorts where characters Donald Duck and Goofy were teamed up with Mickey to create a more entertaining story. The short was directed by Clyde Geronimi. Mickey, Donald, and Goofy are cleaning their tugboat while singing sea shanties, with Mickey being hoisted to the top of the mast to varnish. His bucket of varnish, however, is accidentally swallowed by a sleepy pelican, who becomes drunk on its contents. As Mickey battles the pelican, an announcement is heard over their radio that the steamship Gigantic is sinking, and Mickey scrambles to get his crew moving to rescue the ship. Donald and Goofy quickly start the ship, although they soon run out of steam. Goofy tries to shovel coal into the boiler, but the door continuously shuts on him, sending the coal flying back in his face. Donald then breaks the pulley, and when he tries to reassemble it, he is mocked by the steam. The pulley catches on to Donald’s hat, but when he tries to retrieve it, the steam completely fills up the hat and explodes on Donald. Mickey continues to listen to the distress signal, and calls down to Goofy for more steam. 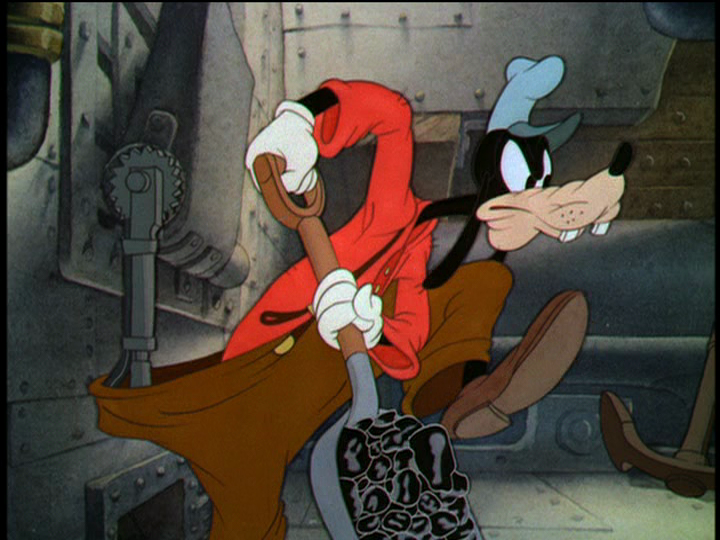 Goofy attempts to take a running start to shove the coal in the boiler, but doesn’t realize that he caught his pants on a lever that released all the coal into his pants. The coal and Goofy go flying into the boiler, and when Goofy lights a match to see where he is, he is shot out by an explosion, followed by a steady stream of flames. Goofy shuts the boiler with an anchor, and a steady stream of steam is sent flowing through the mechanics of the ship. The pulley that Donald was trying to fix fixes itself – unfortunately, it traps Donald through his shirt, and Donald is knocked around as the steam makes the tugboat work on overdrive. Mickey tries to steer the tugboat, but it seems to have a mind of its own, and the boiler explodes, leaving this ship as nothing more than a wreckage. The distress call continues, until it is cut off by a radio announcer saying that they’d just heard the final broadcast in a radio drama about the Steamship Gigantica. Angered, Mickey, Donald, and Goofy drown the radio in the ocean. Posted in Uncategorized and tagged 1940s, Color, Donald Duck, Goofy, Mickey Mouse, Short film. Bookmark the permalink. 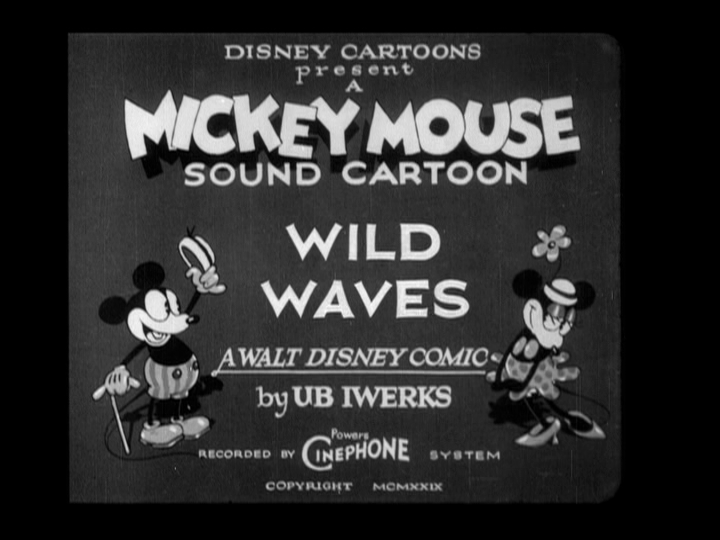 On April 25, 1930, the Mickey Mouse short film Wild Waves was released to theaters. This was the first short film directed by Burt Gillett. Mickey is having a fun day at sea as the lifeguard, entertaining the local wildlife by whistling a tune while playing the banjo. He nearly falls from his lifeguard stand, but manages to hang on, although he is thrown for quite a loop when the stand starts to dance on its own. Minnie has been changing in a nearby stall while singing “My Bonnie Lies over the Ocean,” and hops out in her swimsuit to enjoy the beach. She barely escapes a large wave sweeping toward her, but continues to make her way down the shore, until she is swallowed by the ocean. Mickey throws out a life preserver, then grabs a small dinghy to go after her, with disastrous results. She is thrown about in the ocean, and Mickey is also swept away, but swims frantically to save her. The waves keep them apart for some time, until Mickey is able to bring her back to shore. She starts to cry, but Mickey tries to comfort her. He offers her his handkerchief, then whistles a tune and dances to make her laugh. The local animals join in on his dancing while Mickey makes a harp out of an old volleyball net. The animals start to sing while Mickey makes more instruments out of old anchors and the like. Minnie is thrilled at the performance, and applauds wildly. She then calls Mickey her hero, although he bashfully brushes it off. She gives him a kiss, and the two end the short with an embrace. On April 24, 2009, the Disney Channel Original Movie Hatching Pete premiered. The movie premiered with 4.1 million viewers, one of the lowest openings for a DCOM in three years. The film was written by Paul W. Cooper, and was directed by Stuart Gillard. It stars Jason Dolley as Pete Ivey, Mitchel Musso as Cleatus Poole, Josie Loren as Angela, Tiffany Thornton as Jamie, and Brian Stepanek as Coach Mackey. The film begins at Brewster High School’s basketball game, where the mascot is getting suited up for his big entrance. However, Cleatus Poole, who goes by “Poole,” is the worst mascot the school has ever seen, thanks to his allergy to the suit. His best friend, Pete Ivey, shows up at the game, only to once again be mistaken as a new student as he is extremely shy and introverted. Poole is aware that Pete has a crush on his sister, Cammie, and Pete is hoping to ask her out, but Pete fails miserably thanks to his shyness, and she is dating basketball team captain and all-around jerk Dill. Poole and Pete leave the game, both feeling rather dejected. Pete heads home and practices gymnastics on his home trampoline, displaying a natural talent. His father tries to give him a pep talk, and his parents try to get him to go to the game, although Pete refuses as Brewster has lost the last twenty games and doesn’t see the point. Poole stops by before the game, and asks Pete for a favor: $500, and for Pete to be the mascot for the night. Pete refuses at first, especially after Poole brings up the story once again that it’s his family legacy to be the Rooster, which is why he can’t quit. Pete only agrees when Poole promises to put in a good word with Cammie. The game starts, with the rival team scoring right off the bat. Pete, in the mascot outfit, makes his way to the game and runs inside, although he is rather ungainly in the outfit. He tries to act like Poole, and ends up knocked to the ground by the rival team. As he decides to leave, he gets hit in the head with a basketball and flips on the ground. After getting injured, he decides to give people something to notice, following his dad’s advice, and begins dancing and flipping, entertaining the crowd more than the game. Pete heads to Poole’s after the game to return the outfit, but he can’t admit to Poole that he actually liked being the mascot. At school the next day, students are congratulating Poole for a job well done at the game, although Poole has no idea as to why. Meanwhile Coach Mackey, who was kicked out of the game for unsportsmanlike behavior, tries to get Poole expelled for the antics of the mascot, but the principal says that that Poole stays, as he has better job security than the coach. In the locker room, Poole is about to get beaten up by the basketball team, but is begrudgingly saved by Coach Mackey, as the coach will be fired if there’s no mascot. Things get weirder when Poole goes to class and everyone applauds him, with Pete being pushed aside while Poole takes credit for Pete’s antics. Pete then starts working on the float committee for the homecoming parade with new girl and cheerleader Angela, and he starts crushing on her, even though she has a boyfriend back in Houston. Later, Poole stops by to ask Pete what Pete did at the game. Pete can’t describe what he did very well, but Poole wants Pete to continue as the mascot so he continue being popular. Poole decides to go to the game in disguise to watch what Pete does, and to be there in case of trouble. Pete does a variety of stunts as the mascot, much to the delight of the audience and dismay of Coach Mackey. Pete continues his antics while the game once again looks like a loss for the Brewster Roosters. At one point, Pete’s antics distract the opposing team long enough that the Roosters are able to score. Pete then picks up Angela and takes her out into the hallway, and although he successfully flirts with her, she thinks he’s Poole instead of Pete. At the end of the game, Poole congratulates Pete for a job well done, but Pete is still unhappy with Poole getting the glory for all of his work. Poole then tells Pete that Pete’s going to play “The Chicken” full-time, much to Pete’s discomfort. Finally, Poole talks Pete into staying the mascot. Pete and Angela start working on the float together, although she asks him a lot of questions about Poole, as she seems to be developing feelings for “The Chicken.” On the way to a game, the basketball players come up with a theory that it’s not really Poole inside the mascot outfit, which explains why he’d gotten better all of the sudden. Dill goes off to pull the mascot’s head off, revealing Poole, who lets out a huge sneeze. Once they reach the game, Poole quickly makes a switch with Pete, and Pete heads out of the court while a disguised Poole sits in the stands. Once again, Pete’s antics are more interesting than the game, but he also has an effect on the players, and they are able to score more points than usual. At one point in the game, Pete saves Angela from getting accidentally hit by a player from the opposing team, but after Angela has been pushed out of the way, the player hits cheerleader Jamie, whom Poole has been dating since his rise in popularity. Jamie gets a bloody nose, and both Pete and Poole are worried that this could cause problems for them. Angela later thanks Poole for saving her, and Pete overhears their conversation, and stops Poole from kissing Angela. Later, Poole admits that he can’t keep up the façade, as he feels like a fraud, and apologizes for everything Pete’s gone through. Pete is terrified that he isn’t funny without the chicken suit, and tells Poole that he needs to continue being the mascot, at least until the parade. He then hears that Angela is missing, and goes to find her. When he finds her, he sees that she’s been crying, as she’s been dumped by her boyfriend via text message. The two begin to bond, and go back to build the float. 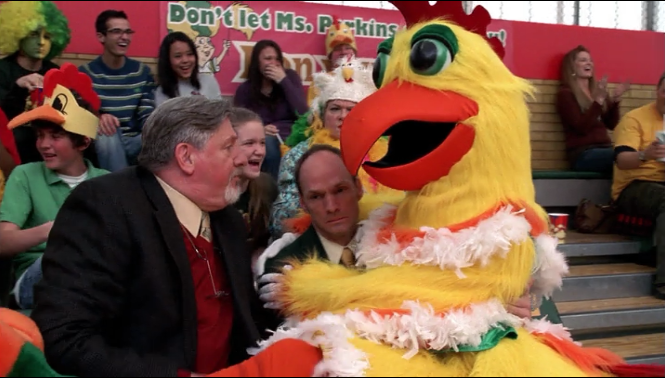 At the parade, everyone cheers for “The Chicken,” while Poole hides in audience in disguise. However, Poole is pulled up onto the float to dance, and the ruse is half-revealed, as no one knows who “The Chicken” is. Pete flees in the sheriff’s car, with the whole town pursuing him. Poole is taken in for questioning by the police as to the identity of “The Chicken,” but Poole refuses to say who the mascot really is. Poole finally admits to his father that he couldn’t be the mascot because he was allergic to the suit. His father admits that he was allergic to the suit as well, and wished he had the courage to quit like his son. Meanwhile, Pete flees to his house and hides the chicken suit in his car. As he walks along the road, Angela stops him and asks him who he thinks “The Chicken” is. He asks if she really wants to know, and she says that she might, but she worries that once the mystery is gone, then the attraction to him will be gone as well. Poole stops by to talk about their next steps, but Pete is furious that Poole ruined everything. Poole decides to that they should retire the mascot, but Pete is unsure. At the next game, everyone is hoping the mascot will show up, but are sorely disappointed when he doesn’t appear. All the fans leave the game when it’s revealed there is no mascot, and the basketball team loses once again. The principal then has Coach Mackey announce to the entire student body that “The Chicken” needs to return, as everyone needs him. At the next game, however, Pete doesn’t come back, especially when he overhears the cheerleaders saying there’s no way Pete could ever be the mascot. However, he does make an appearance on the school’s news program to explain why he decided to call it quits. When he explains why he won’t take off his mask, comparing himself to the Lone Ranger, Angela realizes that Pete is the mascot, as she was the one who told him the same reason why she didn’t want to know. Poole tries to convince Pete to go to the game, but Pete’s afraid people will stop liking “The Chicken” when they realize it’s just plain old Pete Ivey inside. At the Roosters’ final game, the team is scared to play without “The Chicken,” but they summon up a little bit of courage to play. However, true to form, the Roosters play miserably, unable to score a single shot. At one point, the lights in the gym go out, and “The Chicken” appears in the rafters before flying down onto the court. Encouraged by his appearance, the team is ready to win the game. Finally, everyone wants to know who is underneath the mask, and Pete decides to reveal his identity. Angela runs off to help him get his mask, revealing that she knew it was him. Everyone cheers for him, and he resumes his duties as the mascot as the team works on securing a victory, their only victory for the season. In the end, the Roosters win the game, and everyone rushes the court excitedly while Angela and Pete share a kiss.